Reported to be the oldest secular stone building in Wales, Chepstow Castle lies on a cliff face high above the magnificent Wye river. In 1189, Chepstow Castle was inherited by William Marshal through his marriage to Isabel de Clare, daughter of Richard de Clare. With his considerable experience in military architecture learned from his many years in France, Marshal set about modernising and strengthening the castle. The original castle doors are still on display at Chepstow Castle and are the oldest castle doors in Europe, dating from no later than 1190. 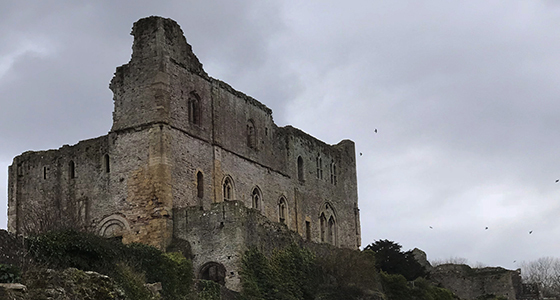 After Marshal had inherited Chepstow Castle, the significant and extensive alterations he made were revolutionary and marked the transition from square towers to the form that was adopted by castle builders in the 13th century. After William’s death in 1219, his sons continued to enlarge Chepstow's defences and improved the internal accommodation. They added a heavily defended barbican at the rear of the castle. They were given assistance by Henry III who had visited the castle prior to William's death and his donation helped with the remodelling of the Great Tower which had remained largely unchanged since it was originally constructed in the late 11th century. It was a bitterly cold and bleak day for our visit. Whilst this was helpful in reducing visitor numbers, it called for grim determination to record in strong winds and snow. Unfortunately multiple recordings were discarded due to excessive background noise. Because the castle is in a ruinous condition, there was little opportunity to escape the weather for a normal length recording session and in total we had less than 30 minutes to review from all areas. Considering the restrictions and climate, we were surprised to capture any EVP. EVP 1: Standing before a door that was made in the 1190s, Rachel decides to move the iron across on the small inset panel. This voice was captured as the bolt was moved. EVP 2: Tracy and Rachel are in an enclosed small room off of the kitchen. Underneath a small window is a ledge with square cut holes allowing material to be tipped directly into the river Wye below. Rachel was joking that it resembled a medieval toilet and the voice echos the merriment in the room, albeit a little cheekily. EVP 3: Two castle visitors very kindly accepted our invitation to join us in a short recording. When asked for the name to be provided of anybody present but unseen to us, we were surprised to capture a name that is very relevent to the castle's history. EVP 4: Although not evidential information regarding the castle, at the time of recording Rachel was recovering from a serious chest infection and was very tired. This was captured in the same location as EVP3. EVP 5: This is a fascinating clip not only because there are three male voices, they are remarkably clear yet the conversation does not parallel ours atall. We do not know who Wolf is but the fog has been described to us in seances; our attempt at communication is like a beacon in fog to those who sense us. It was captured in th same location as EVP3. EVP 5: Very restless - we did ask Wolf - purpose of this fog is it?